Artisan is another word for hand-crafted, so I decided to mix this bread completely by hand without using any fancy gadgets. The original recipe from Gluten-Free-Bread.org had two different ways to make the bread and the complete instructions can be found here. Below, I have just included the process that I actually used to make this bread. I didn’t make any changes to the recipe this time, amazingly. The room was rather warm where I let the bread rise for 90 minutes, which may have contributed to the dough cracking across the top. I could have probably let it rise for less time, maybe 60 or 70 minutes. Even though it wasn’t the most lovely loaf in the world, the bread turned out fluffy and moist on the inside, with a nice crust on the outside. If I make this recipe again, I will probably split it into two loaves because it makes so much. All ingredients should be at room temperature before starting (except the warm water). 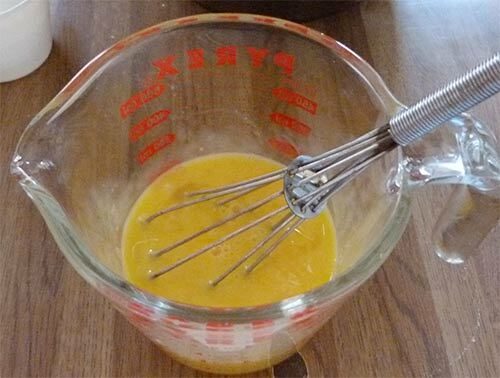 Whisk together the flours, yeast, salt and xanthan gum in a large bowl or the mixing bowl of your stand mixer (a stainless steel metal mixing bowl is fine). 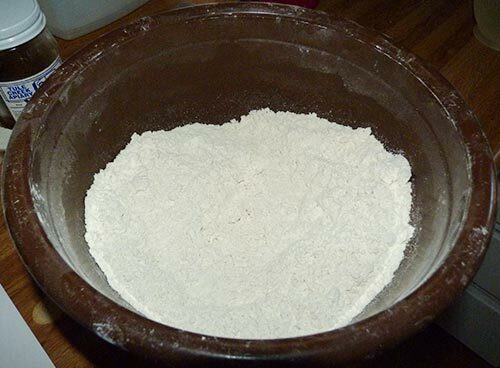 The flours and other dry ingredients mixed together. 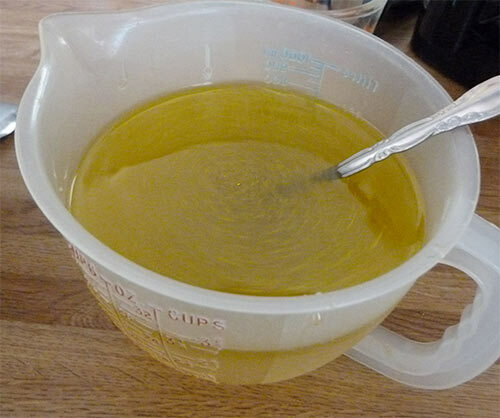 In a small bowl, combine the oil, honey and water and set it aside. The oil, warm water and honey are mixed together before adding to the flour mixture. Four eggs whisked together are added to the flour mixture, then the rest of the wet ingredients. Add the eggs into the dry ingredients and then stir while you pour in about 1/3 of the oil and water. I stirred it by hand with a wooden spoon, so I had to pour some, then stir – good arm exercise! Continue to stir while you pour in another 1/3 of the liquid; the dough will start to come together and become very thick and sticky. NOTE: You can use your stand mixer for these steps with your bread hook rather than stirring the dough ingredients by hand. Add the final 1/3 of liquid and stir until the dough is nice and smooth. Mixed dough placed on parchment paper. 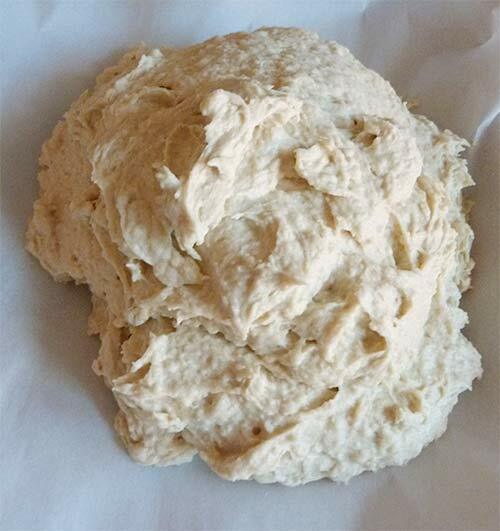 Use wet hands to smooth out the surface of the dough and shape it as desired. DO NOT KNEAD. This may take dipping your hands in the water a few times…to get a nice shape. Gently smooth it out with wet hands into the shape you want. Smooth the dough into the shape you want with wet hands. Cover the dough loosely with plastic wrap. I sprayed the wrap with olive oil cooking spray to prevent it from sticking to the dough. Loosely cover dough with plastic wrap and let sit for 90 minutes. Allow it to rest on the counter for about 90 minutes. If your kitchen is very warm you may only need about 75 minutes. 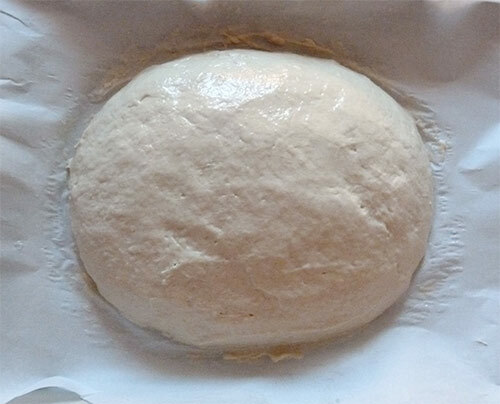 The dough may not have grown much while resting, but it will seem a little bit puffier. Use a serrated knife to design the top of your bread. 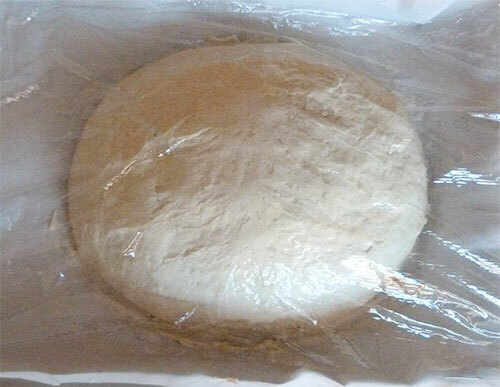 After sitting covered for 90 minutes, the dough had grown a lot and had cracks across the top. Bake it on a stone or cookie sheet. Preheat the oven to 450 degrees F. Place the parchment paper with the dough on the stone or cookie sheet. Place a pan (not glass) of hot water under the baking stone or sheet at least 4 inches away. Bake for 30 minutes. ALLOW THE BREAD TO COOL COMPLETELY before eating. This is important, otherwise, the center may seem gummy. 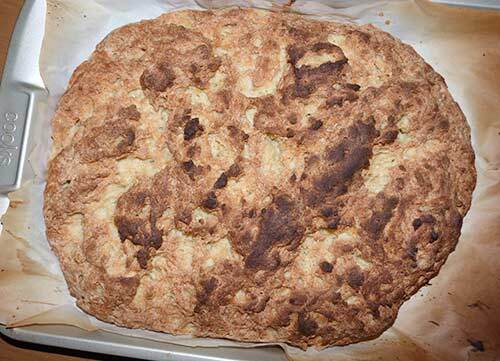 A big THANK YOU to Gluten-Free-Bread.org for this wonderful recipe! 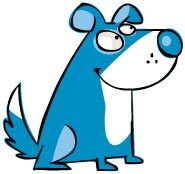 Maizy says I have restless TAIL syndrome. I can’t help it – my tail is so HAPPY it just has to DANCE! Once again Maizy didn’t let us down! 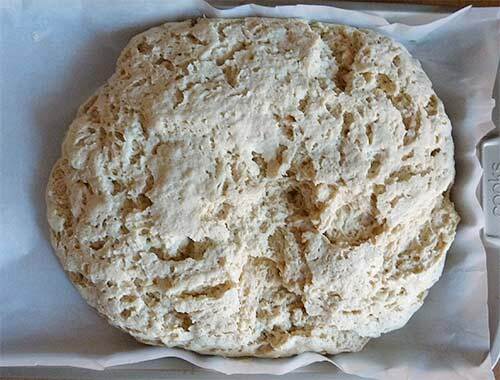 This recipe makes for a wonderful “fluffy” bread with sorghum flour.